Since we started running 7.90 class about a year ago we have been doing tire treatment and using tire wraps. Our prep procedure before each run is to remove the tire wraps AFTER we roll past the water box. In cases where my daughter cannot drive around the water having the tire wraps on keeps the tires drier than if they were not there. The difference between using tire rep and this procedure and not using it is dramatic when you view the graphs of our runs. We have raced at four NHRA tracks and two IHRA tracks this season and we have been allowed to remove the wraps after the water box. This includes the Western Conference Finals in Tulsa. This weekend, at the Division 4 Bracket Finals we were told quite adamantly that we had to remove the wraps at the ready/start-up position. Fortunately, there is room to roll around the water at The Texas Motorplex, so we were not effected too much. I have checked and it seems like this same "rule" is being enforced at some Division 7 tracks and races. As I understand, there have been similar rulings before we started using tire prep and wraps. I have a call into Trey Capps who heads the NHRA Division 4. When I asked the people at NHRA's headquarters in Glendora they said there was no specific ruling. It appears that the ruling is an interpretation of the rule that says the cars must be "prepared to fire and race" at the end of the staging lanes. As I understand, the Division Director can make the call on the interpretation this rule. SO, MY QUESTION IS... WHO ELSE HAS ENCOUNTERED THIS SITUATION? At Eastern Conference finals in Bristol you are required to remove them at the end of staging before you roll under the tower. Here is the wording straight from the 2018 NHRA Rulebook. Page 37 in Tire and Wheels. After reviewing our graphs it appears that waiting to take our wraps off after the water box had little or no effect. We still won the next two rounds after we were told we had to remove the wraps where we fired up. I had been following the directions on how to do the treatment process from people who race in Division 7. This was how many of them were completing the process. We will just adjust our routine a bit. That said.... Bristols track and even the area between staging lanes and the track is pristine and clean!! Also ..and this is a big one...it is a Jr only race!!! Therefore they dont pick up a ton of stones and debris driving around the track and then shoot them all over behind the water box as the big cars do !! At a regular race with all classes, the area behind the water box gets littered with all the crap coming off the big car tires at burnout. So this is why keeping covers on until after the water box (or just before for those who do burnouts), is important for Jrs. We have been at races where we have discussed this with officials and even had their views changed for the race. Yes I do believe it is a rule that they must be removed at end of staging lanes, but I would argue that point if enforced and really feel the rule should be adjusted for Jrs!! Especially because so many do not do burnouts. Personally, I can't see how keeping the wraps on until after the water box hurts anything or anyone. Chris McGee mentioned that he thought some people had complained about the prep getting onto the track and effecting them. In truth, any left over prep would help more than hurt anyone. We run our car at three tracks and all three keep the start up area clean to different degrees. We do a lot of test and tune at North Star Dragway (Denton, Texas) and their track prep is as good as it gets. In fact, the track is so sticky that the car runs as much as a tenth slow compared to The Texas Motorplex. Of course, they have no bracket races at North Star. We run brackets at Paris Dragstrip (Paris, TX) and they have an so-so surface prep, but the start-up area up to the burn out box is kept fairly clean. They really try hard to please everyone. The Div. 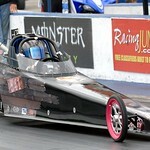 4 Junior Finals were at The Texas Motorplex and that was where I was told to remove the wraps at the fire up line. At the finals the area was pretty clean because it was a junior dragster only event. However, during the regular brackets and other events where the juniors run with the big cars there is a lot of debris. I can't say anything there without raising the hackles of track management because they are already mad at me for moving to a different track. I am going to talk with NHRA to see if I can start a conversation about an exception to the rules for junior dragsters. Yes, but this isn't only a Division 4 deal. The same rule has been reinforced in Division 7 over the summer. How did your discussion with the NHRA go ? I have been too busy to call them. When I did talk to someone at NHRA about this in late October they said that there was no specific rule. That is correct and incorrect. May want to read the rule book because there is a specific rule against it. In section 5. Tires and wheels, last line under tires. our track is filthy, rocks in the water box, we do a water burnout no prep. we put out of town people with there tire covers on the trailer all the time. slowgoat wrote: May want to read the rule book because there is a specific rule against it. This was already stated earlier in the thread. I may have framed the question to the NHRA official where his answer was in response to the tire prep itself. Tire prep is legal, but according to Chris McGee, there have been instances where people complained that the tire prep compound was contaminating the start area. He didn't say when or where this was brought up, but I assume that it was at a Div. 7 track since Chris races out of Div. 7. He said that he had heard of big car teams complaining that the junior dragster tire prep was effecting the burn out box and starting line.